It’s one of the greatest showdowns in recent movie history, and now it’s a “Great Showdowns” print by artist Scott Campbell. 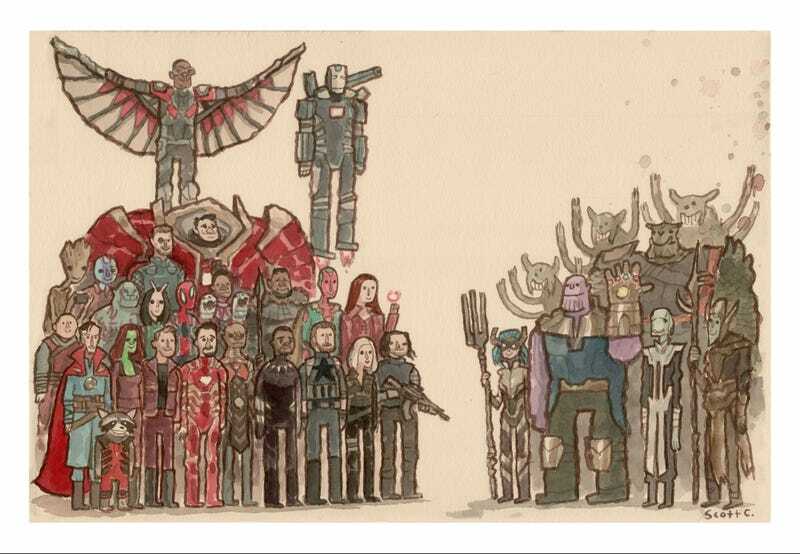 Campbell, also known as Scott C., just revealed his brand new painting inspired by Avengers: Infinity War, which pits all of the film’s heroes against all of its villains in one epic image. It’s the latest in his long running series called “The Great Showdowns,” which depict memorable confrontations throughout pop culture history. You can see Scott C. Showdowns going back years at this link and check out the full Infinity War piece below. The Infinity War Great Showdown by Scott C.
Prints of this awesome piece will be available at Scott C.’s booth at Comic-Con, #2643. It’s a 13 x 9 inch edition of 200. One hundred will be on sale at SDCC, and the other hundred will go on sale at this link at a later date. He’ll also have a tonne of other new Showdowns and more at the con; visit this link for more information.